Box Text: Hey Dude, get ready for the ultimate in rad video! 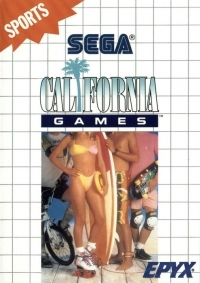 Sega's California Games takes you to the sunny beaches and deserts of the California coast for some gnarly sports competition. Kick it down on a skateboard. Ride the waves to surfing heaven. Cruise the concrete on skates or the rough track on a BMX. Test your toes with a footbag or your long concentration with a flying disk. In a word: awesome. You can play with up to 8 of your friends. Practice events. Compete in one, some or all to become the total California Champion! And you can play for some of the hottest teams around around representing the heaviest names on the circuit. So what are you waiting for? Grab your board and get ready to achieve a new state of Sega cool. 02-10-2014 exonerator Description Blue cartridge variant. 02-10-2014 exonerator Box Text Hey Dude, get ready for the ultimate in rad video! Sega's California Games takes you to the sunny beaches and deserts of the California coast for some gnarly sports competition. Kick it down on a skateboard. Ride the waves to surfing heaven. Cruise the concrete on skates or the rough track on a BMX. Test your toes with a footbag or your long concentration with a flying disk. In a word: awesome. You can play with up to 8 of your friends. Practice events. Compete in one, some or all to become the total California Champion! And you can play for some of the hottest teams around around representing the heaviest names on the circuit. So what are you waiting for? Grab your board and get ready to achieve a new state of Sega cool. This is a list of VGCollect users who have California Games (Blue Cartridge) in their Collection. This is a list of VGCollect users who have California Games (Blue Cartridge) in their Sell List. This is a list of VGCollect users who have California Games (Blue Cartridge) in their Wish List.